At this point in the process, you have your quilt pattern drafted and you have reviewed, checked, and double-checked the math a few times. Now it is time for test the pattern to make sure that it is understandable, correct, and easy to follow. As a pattern designer, one of the scariest e-mails you can receive is about an error in your pattern. With your mistake, you have caused a quilter to waste valuable time and fabric. Testing is important to minimize pattern mistakes. In addition to making sure your math and directions are correct, testers can help improve your pattern. 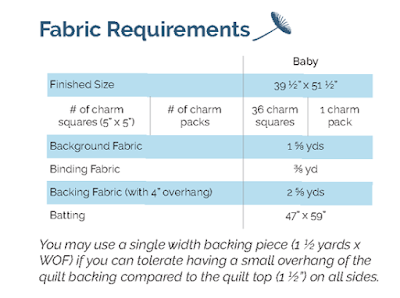 For example, in one of my charm square friendly patterns, a tester suggested adding fabric requirements to use fat quarters instead of charm packs for larger quilt sizes. In another pattern, one of the testers said that it would be helpful to add yardages needed if someone wanted to make a background out of a single fabric instead of a scrappy version. 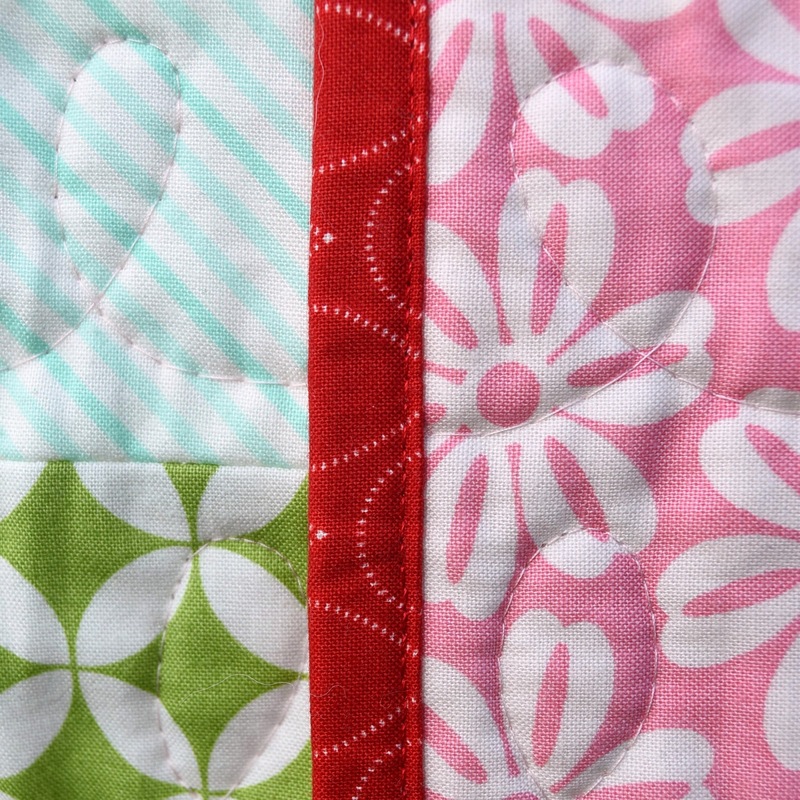 These were both great upgrades to my quilt pattern and made it more useful to buyers. In previous comments, there were some questions on how to know whether the piecing instructions were too brief or too wordy. Besides finding the right balance by simply practicing and practicing writing patterns, your pattern testers can give you valuable feedback on your instructions. Most of the time, I write out my entire quilt pattern and then I become the first tester by going through the quilt pattern as I make the quilt. In rare cases, I make the quilt first and then write the pattern. Typically, when I do this I will still be the first tester and will remake the quilt in a different size. As you work through the pattern yourself, try to follow the instructions word for word, and take notes on the pattern as you go. Using pattern testers is totally optional, but I am definitely a proponent of using testers. Testers will be able to tell you if any parts of your instructions are confusing and point out areas for improvement. They will recheck your quilt math, correct your grammar, and help with conciseness, clarity, and layout. Everyone reads and interprets directions differently and what makes total sense to you might be confusing to another quilter. If you are lucky enough to have a number of pattern testers, you should try to have them test a variety of quilt sizes. If your pattern contains baby, lap, twin, queen, and king sizes, it would be more helpful to have a variety of sizes tested instead of 5 people testing the lap size. There are two main types of pattern testers, one that will make a quilt (or quilt top) with your instructions and one who will review your pattern (text, math, etc.) without actually making a quilt. Both are good and valuable testers. b. What Makes a Good Pattern Tester? A good pattern tester will give you feedback on what to improve and not simply make quilt using the pattern and say that the pattern was “good”. 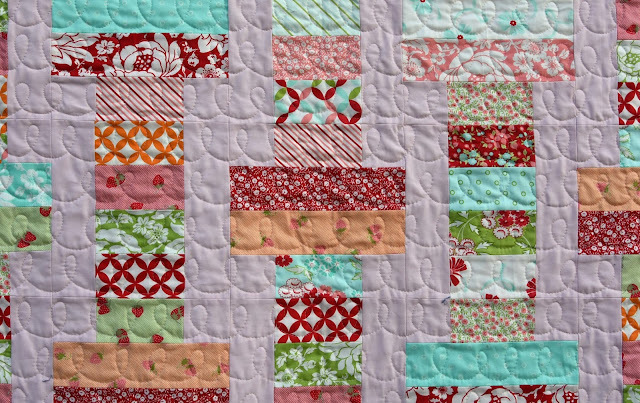 A quilt pattern is like any other written document, there is always room for improvement. This is a sensitive topic, doing a good testing job takes hours so should you pay your testers? This is a question you are going to have to answer for yourself. A majority of pattern designers do not pay pattern testers. In addition to being a pattern designer, I am also a pattern tester for a number of quilters. I personally have never expected any payment when I test patterns. I truly enjoying testing quilt patterns (I am of the non-quilt making tester variety) and enjoy helping other pattern designers. I have received gift cards and handmade items as thank you’s and love them, but do not expect them. I do not pay my testers. Instead, I offer to test their patterns, mentor new pattern designers, sponsor giveaways on their blogs, give copies of the finished pattern, make small gifts, send gift cards, etc. I try to pay them back as much as I can as I understand the time and effort that they are spending to help me improve my pattern. 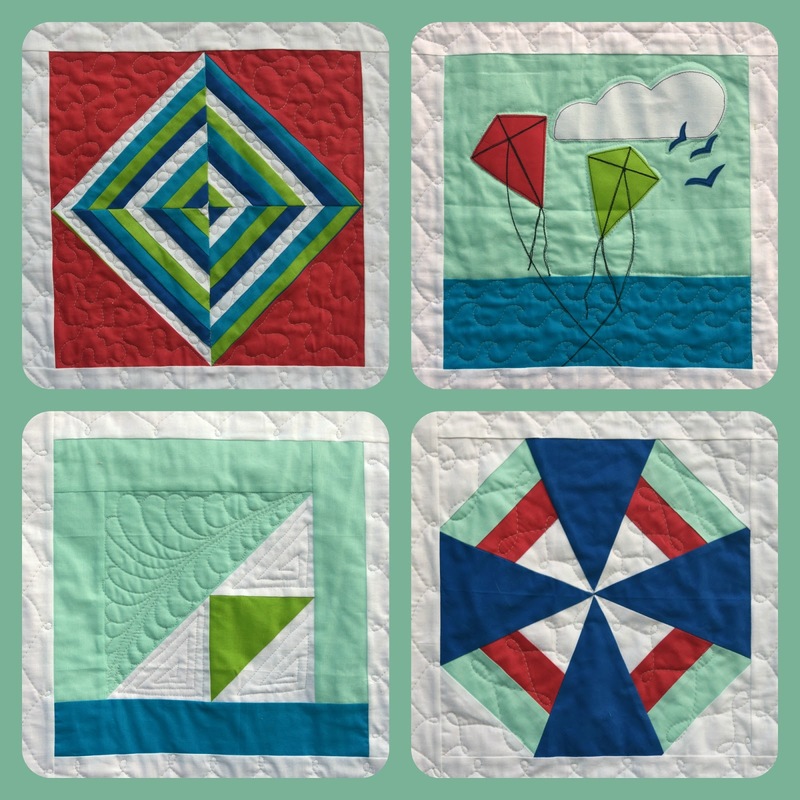 Yvonne at Quilting Jetgirl has an excellent post about her decision to pay pattern testers. 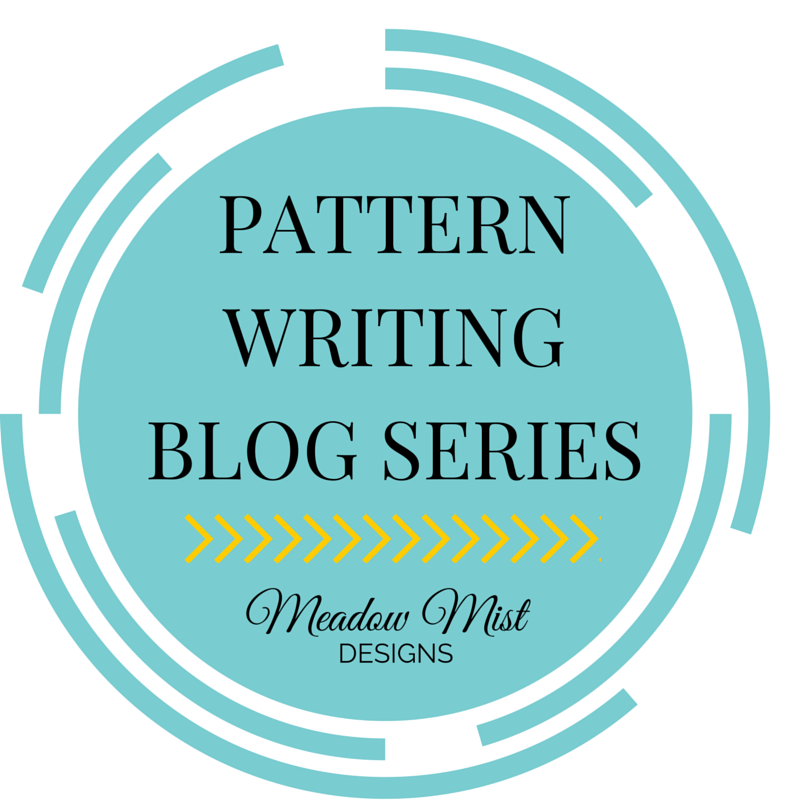 I encourage you to go to her post for another perspective on pattern testing. 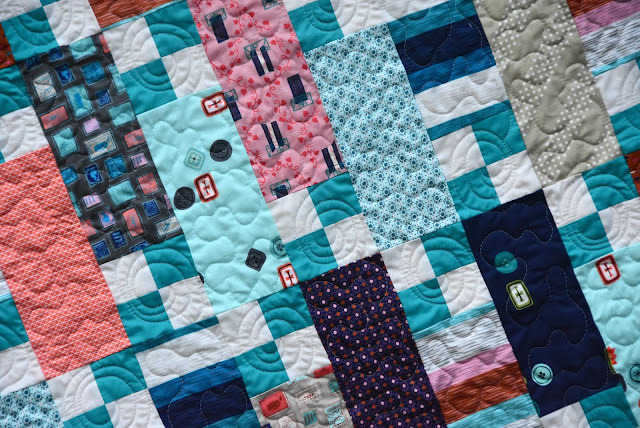 There are lots of quilters out in the world that would love to test your quilt patterns, but the big question is how to find them. 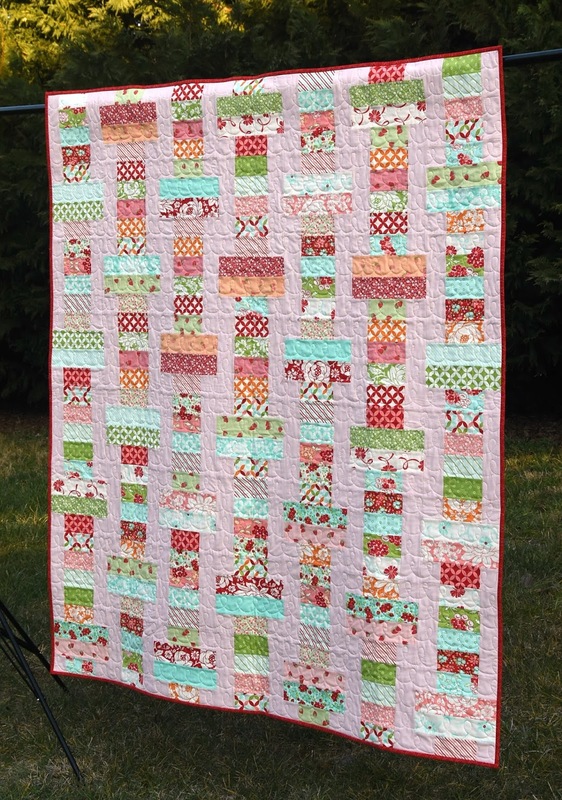 If you have a blog or are active on Instagram, you can put up a picture of the quilt and call for pattern testers. You can also find testers at your local guild if you are a member of one. (There will also be a new resource to find testers that will be announced on Thursday, hint hint). If you are able to find another pattern designer, you can test each other’s patterns (this also solves the issue of paying for pattern testing as the testing goes both ways). There are also quilters who advertise on the internet to test your patterns for a fee. I find that you do not need 10+ people testing your pattern as the whole revision process and organizing the testing becomes overwhelming. I typically use between 3 and 6 testers per pattern. What is the time-frame for testing? Are they to make a quilt block, quilt top, or finished quilt? Are they allowed to show pictures of the progress and finished quilt or keep it secret? Are you going to be compensating the testers? 2. Did any parts of the pattern seem too crowded or spaced apart? 3. Any illustrations or photographs too small or too large? 4. If you printed the pattern, was everything in the printed copy easily legible? 5. Were there any steps you had to read more than once or twice to understand what they were? Were there any part of the pattern that could be helped with more explanation? 5. Would instructions for using another size fabric (for example: yardage versus pre-cut be helpful)? 6. Any other tips for improving the pattern? Stay tuned, on Wednesday (March 2nd) we will have a round table discussion with the guest designers about their experiences with testing their patterns. 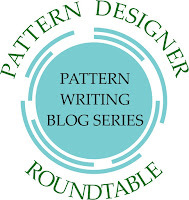 On Thursday (March 3rd) I will be announcing a super new resource that will help you with pattern writing, tester finding, and connecting with other pattern designers! 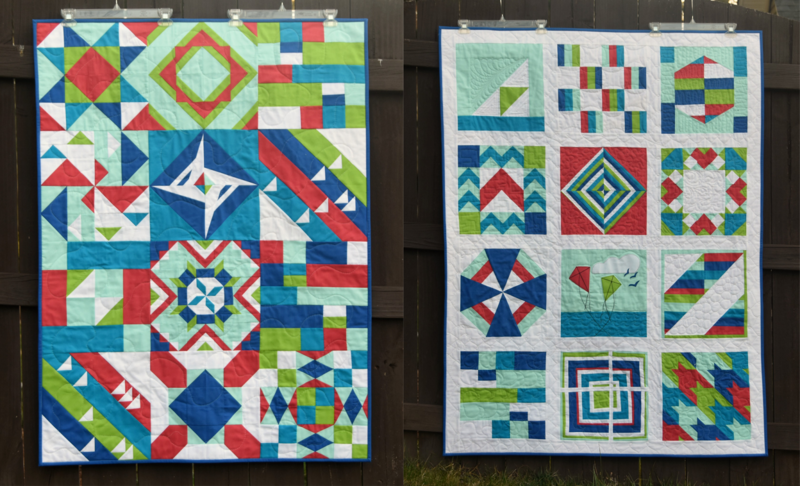 I finally finished the quilts made from the charity blocks from the Fabri-Quilt New Quilt Bloggers Blog Hop 2015 (just in time to announce the next hop, see below!). I had 24 blocks so I figured that I would make two baby/toddler sized quilts. Which layout do you prefer? I am still really torn, I really like the colorfulness of the nonsashed version and how the blocks interact with each other and I also really like how the sashing frames the blocks in the sashed version making each individual block stand out more. Seeing them side by side if I had to pick I would go for the unsashed version. 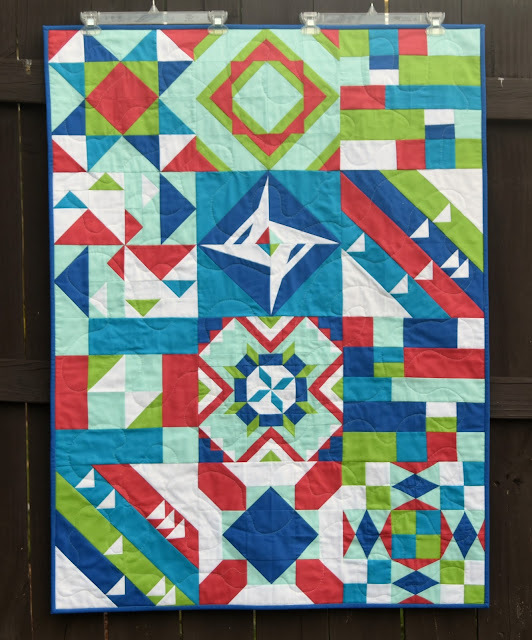 You can find all of the blocks and their tutorials on Jayne from Twiggy and Opal's Pinterest board and you can find Yvonne's amazing charity quilts she made with her blocks here and here. I will donate the two quilts through my local guild, the Foothills Piecemakers Quilt Guild. Both quilts will go to the Serenity House which is a organization that provides women who are struggling with addiction and their children housing, food, and support. Most of the women and children show up with little to nothing and truly appreciate the quilts. Thanks to all of the quilters who contributed blocks for these charity quilts, they are going to make some kids very, very happy. 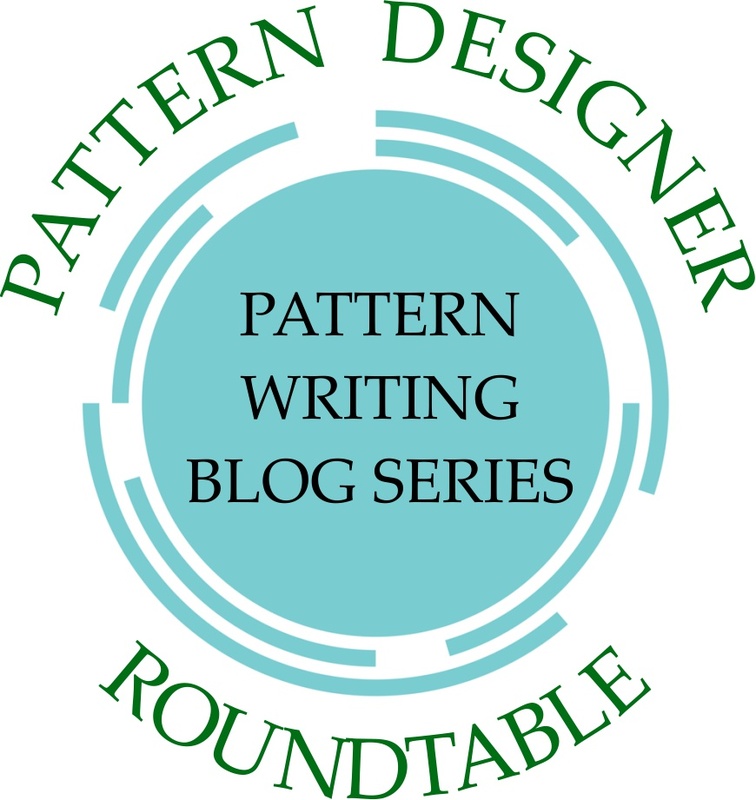 As part of the Pattern Writing Blog Series, our guest designers will be posting some in-depth discussions on some of the different topics. Today, we will be visiting Amy from 13 Spools for a discussion on how she writes paper pieced patterns, including a video of her process! Please hop over to her blog for the post and some information and tips. We have now finished up our Topic VII on Illustrations and Text. 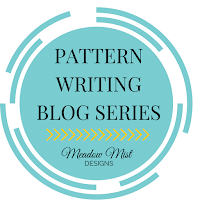 If you have missed any of previous posts in this topic or any of the earlier topics, they are all available in the Pattern Writing Series Tab above. See you next week for Topic VIII, Pattern Testing! Tomorrow (Thursday, Feb 25th), Amy from 13 Spools will be posting on writing patterns for paper pieced designs including a video of how she makes her patterns! 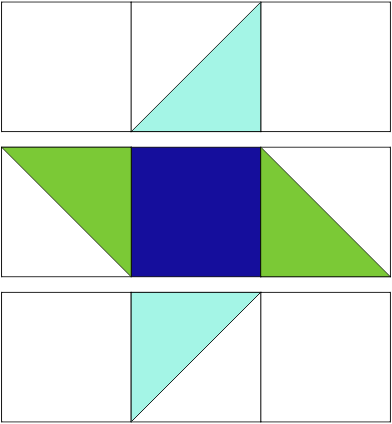 In what order do you draft the pattern (do you start with the text, graphics, math, etc)? Soma of Whims and Fancies - My pattern drafting always starts with a drawing, which I then turn into a pattern and finally write the pattern file. Yvonne of Quilting Jetgirl - I pretty much always start with the quilt math, then I make the graphics, and I fill in with writing the text along the way. Sitting down and writing the text is the hardest part for me, so if I break up the writing as I do the other steps it helps me maintain momentum. Breaking up the writing also allows me more time for editing / reviewing what I have written. Also, I tend to do the quilt math first because it is fun. I do the graphics second because I find that if I can visually represent a step it is much easier for me to then describe the step in writing. I want to echo what Anne and Christa point out about altering a pattern design. 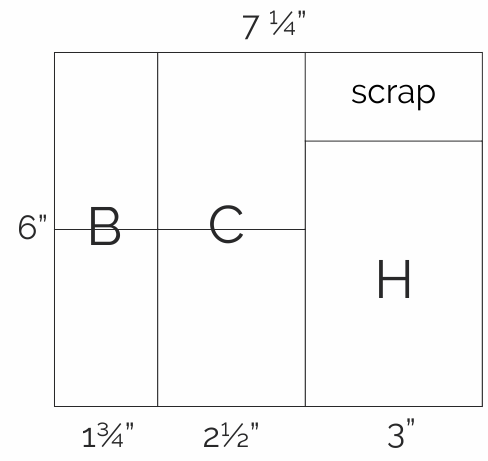 Sometimes cutting instructions end up with poorly utilized yardage, and for those designs I try to grow or shrink a block or design to work better. Anne of Springleaf Studios - Once the design is finalized, I do all the math and even tweak the design if it makes the yardage work better. I usually work out yardage and cutting simultaneously. 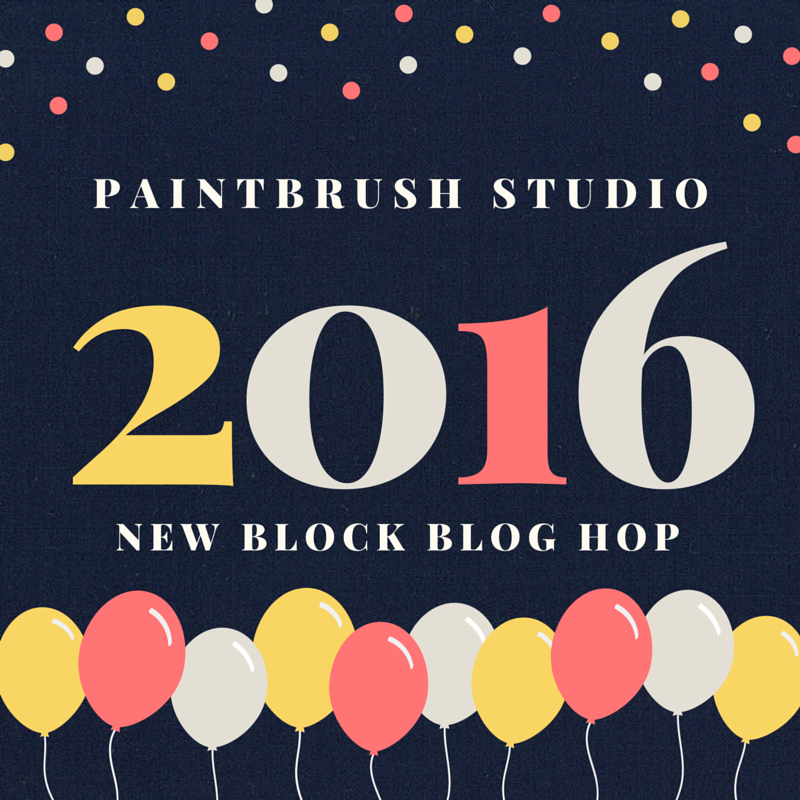 The next step is usually a combination of illustrations and block directions. The final text, including the Design Lesson and Design Exploration text is the last thing I do. I agree with Yvonne that having the visuals is helpful for the writing. Also it amazes me how many different ways you can describe something. Being consistent and concise are important. I think it's helpful to have a system not only for the whole process, but also to give yourself some writing guidelines in terms of format so you can be consistent from one pattern to the next. When it comes to calculating yardage, I'm fine with the basic math part, but I am curious to know whether anyone factors in a little extra yardage for cutting mistakes and/or a percentage for shrinkage? I once read somewhere that the designer should assume a 40" WOF and include a 5% shrinkage rate. Does anyone do this? 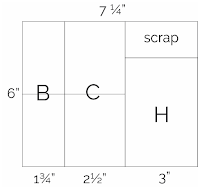 Another question; what do you do if you can get four pieces out of the WOF if it's actually 42" of useable width but not if you only assume 40"? Would you only count on getting three pieces and calculate more yardage or adjust the pattern to work with 40"? It gets messy when you start over thinking all these things which is what I tend to do. Christa of Christa Quilts - I start with the design and then make a lot of notes. I usually do a piece count for myself as a double check. I figure out the math that is needed first, such as how many squares I can cut from a strip of fabric, etc. If the math is weird, for example, if I need exactly 41” from a WOF strip of fabric, then I will try to alter the pattern so that pieces can be cut efficiently from 40” of fabric or less. Also, I try not to use non-standard finished sizes if that can be avoided. Once the pattern text is completely written, I will draw the rough illustrations. Then I make the quilt and do the photography. I only use photography for the cover picture and quilting details. All of the step-by-step instructions are done with illustrations. When the quilt is finished and the pattern parts are ready (photos, rough illustrations, text), I hand that off to the graphic designer to create the first pattern draft. We then go back and forth several times until I’m happy with the final layout and design, and I’ve double checked all the math and spelling. 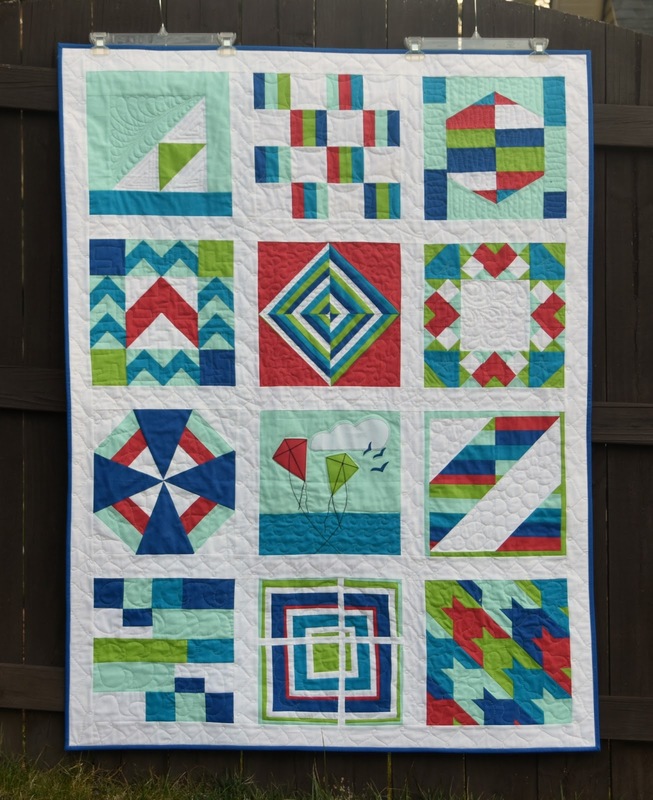 Lorna of Sew Fresh Quilts - Because my typical pattern is one that uses the Stitch and Flip method, once I have finalized the design, I usually start drafting the pattern by working on the graphics, breaking each block down into the pieces needed to construct the block. From there I work out the instructions for the construction of the blocks. And then total how many pieces are needed for the blocks. Once I know how many pieces are needed, this leads to the cutting instructions. Then I use the cutting instructions to figure out how much yardage is required. If you look at how a pattern is laid out, writing the pattern is much like starting from the end and working your way back to the beginning. Amy of 13 Spools - I draw out my pattern, then figure out the cutting directions. I write out the cutting directions by hand, and loosely write out the piecing directions by hand. If I know I’m going to write a pattern, I consciously consider myself the “first pattern tester” and write corrections & notes as I go. Then I just kind of do the rest all at once. Or whatever strikes my fancy at the moment. Come back tomorrow for Amy's post about writing patterns for paper pieced designs including a video of how she makes her patterns! I love Fat Quarter Shop's Shortcut Quilt patterns and am so excited to show you my version of their shortcut pattern called Jelly Slice! 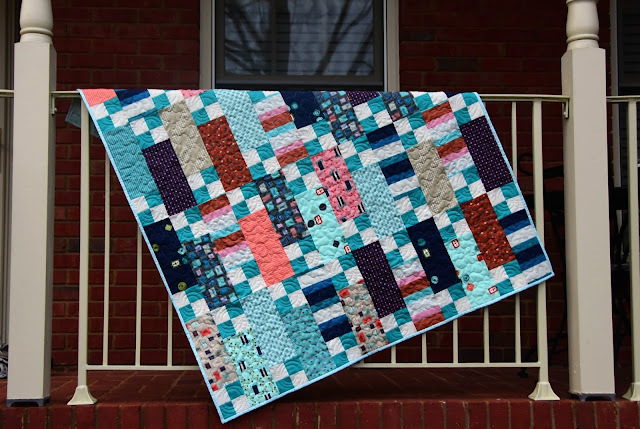 I had so much fun making their Layers of Charm quilt last year, so when I got an e-mail earlier this year asking if I wanted to take part in the launch of a new Fat Quarter Shop pattern I did not hesitate in sending back a big "yes, please"! 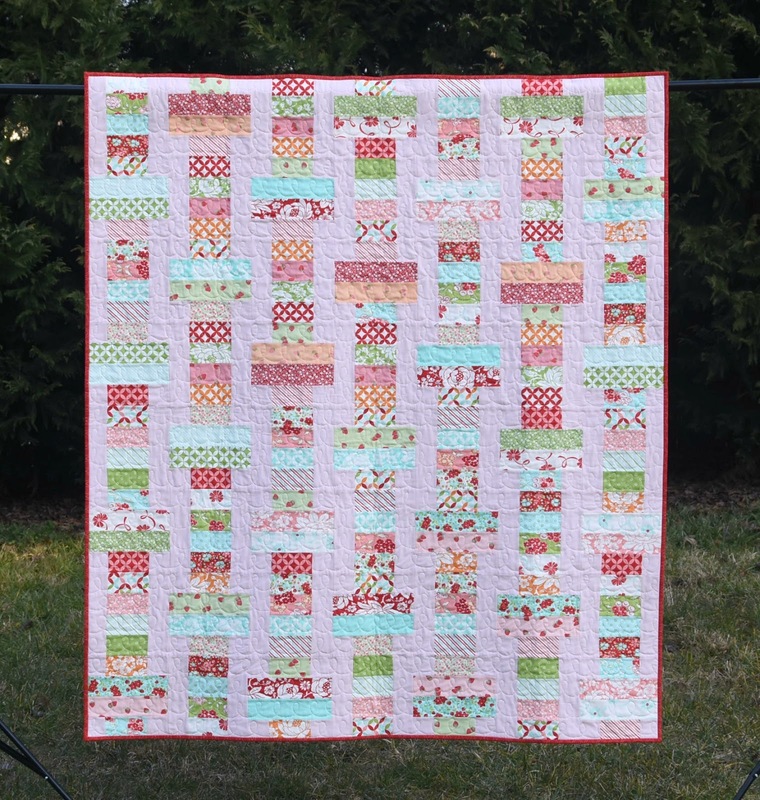 The Fat Quarter Shop's Jelly Slice pattern is completely free and, you can download the PDF pattern here and watch the video tutorial here. The lap size (which I made) uses one jelly roll and some background yardage to make a nice 57.5 x 57.5" lap sized quilt. The pattern includes instructions for baby, lap, twin, and queen sizes and is very easy and precut friendly. I chose to make my version using a Hello Darling jelly roll from Bonnie and Camille (one of my favorite designers). My first instinct was to pair the jelly roll with a white fabric background, but I thought that a light pink would actually stand out well against some of the lighter prints which are mostly white. (I have paired Hello Darling with a navy blue in my Cake Slices quilt which also worked really well, you can see here). I love having the color cards of solid fabrics for most of the major manufacturers as it makes selecting a solid so much easier. I found the perfect light pink, Bella Solids in Baby Pink by Moda Fabrics. The quilt came together very quickly and soon it was time to quilt. Using the rows of piecing as a guide (no marking, yippee), I quilted loops in each row (that sort of looked like an entire row of cursive l's). 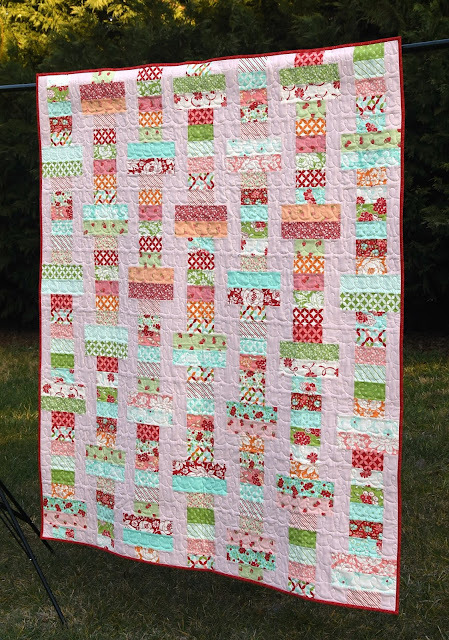 The loops are a quick quilting pattern and give great texture to the quilt. I was so happy to find that I already had the exact Auriful thread match to the pink background, color 2410 in 50 wt. I used all of my machine binding practice from charity quilts to machine bind this quilt and I am very happy with the way it turned out. (I used the pink Auriful thread in the top and red Aurifil thread in the bobbin so that the stitching on the back of the binding would match well). For the backing I used a piece of Lucy's Crab Shack by Sweetwater I have had forever. Today we are going to discuss the illustrations and text within a quilt pattern. I will be giving some guidelines and advice, but how you actually write the pattern and develop your voice and style will come with time and practice. At the bottom of this post, after we go through all of the parts of Ninja Bears, you can download the entire pattern! You can use illustrations, photographs, or a combination of both in patterns. It tends to be more common to have illustrations in patterns and photographs in tutorials. I am not completely sure why this is, it could be because people find photographs quicker and easier to take. I personally prefer to use illustrations in both patterns and tutorials for a variety of reasons. Firstly, I am a night quilter which is not conducive to taking great, no flash, natural light pictures. Secondly, I sometimes change my mind on what I would like to show in the pattern, and if you are relying on photographs you might have to sew up another block just for a picture and take a lot of in-process photos. Thirdly, I find it more difficult to label a picture and have the labels be easily read. For all of these reasons, I prefer creating illustrations for my patterns. I am comfortable enough with Corel Draw that I can create all of my illustrations pretty quickly. Photographs may be very handy for more difficult to draw steps, like showing curved piecing and 3D sewing steps (like handbags, clothes). B. What Illustrations to Include? I next “unstitch” the block one step at a time which for this block would be to separate the pieces into rows first. I “unstitch” again to break the rows into their individual pieces. Obviously, the more complex the block (or larger number of different blocks), the more illustrations there will be in this section. I will also label some of the illustrations with the piece size and/or letter depending on the pieces and whether or not which piece is which is clear from the instructions. 3. Quilt Top Assembly – Patterns will usually contain one or more illustrations showing how the blocks go together into the quilt top. 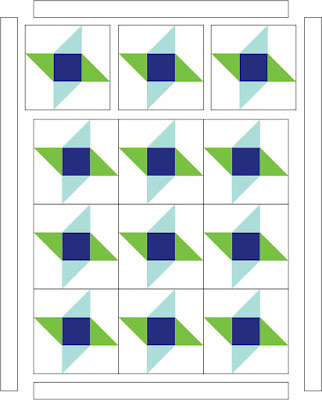 Very commonly, the illustration will show most of the quilt already pieced together with the second to top row spaced from the row below it and the top row broken into individual blocks. (The quilt top below is so simple I opted to just show one row unstitched.) Borders can be added to this illustration or may be shown in a separate illustration. 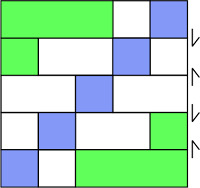 This section may be at the top of the first page of the pattern instructions and/or may be on the back cover of the quilt pattern (if it is in a printed format). I use this section to describe the pattern itself, where the block came from, different options within the pattern, etc. I also include any pattern notes here such as assumptions about the quilt pattern we discussed in the General Pattern Writing section, abbreviations, and assumed WOF. We discussed all about the fabric requirements and how they were calculated in the Quilt Math topic in this series. This section can contain a listing of the material requirements or a chart with the information. Some of the information in the table is optional, for example, the batting size requirements are listed by some pattern designers and not included by others. All of the math and cutting calculated using the Quilt Math part of the Blog Series so now the cutting and piece numbers need to be placed into written form. Each pattern designer writes this section differently and uses slightly different terminology and language. 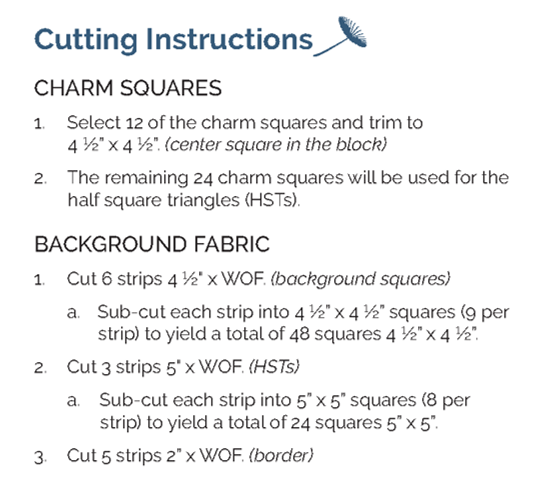 I typically write my cutting instructions by first stating the number of strips of a certain thickness x WOF need to be cut and then how to sub-cut the strips to the desired piece sizes for the pattern. Optional (but really beneficial): It is very helpful to the pattern reader if you note where the pieces are going to go in the quilt top in the cutting section. This makes it easier for quilters switch out different fabrics for different areas of the quilt top. 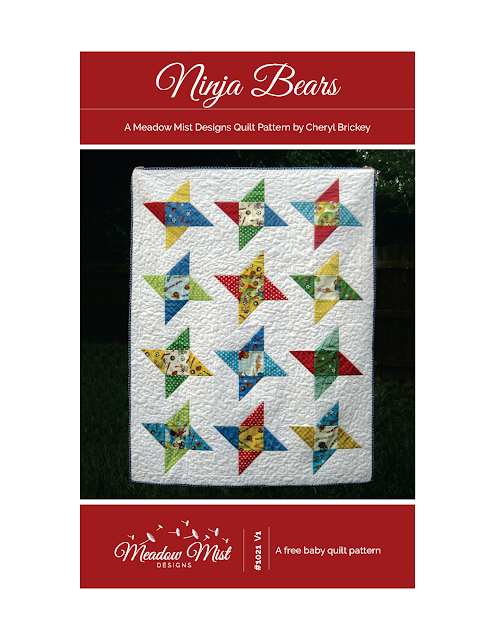 For example, in Ninja Bears, a quilter might want to have the background in the block one color but have the border a separate color. 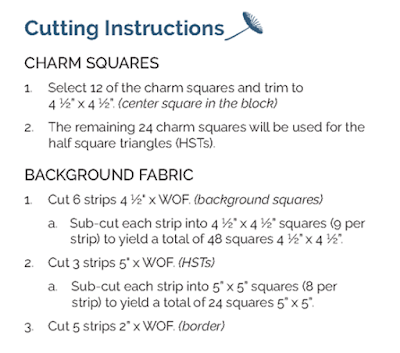 Instead of having to look through the piecing instructions to determine which fabric pieces are used where, the cutting instructions will clearly indicate their placement. 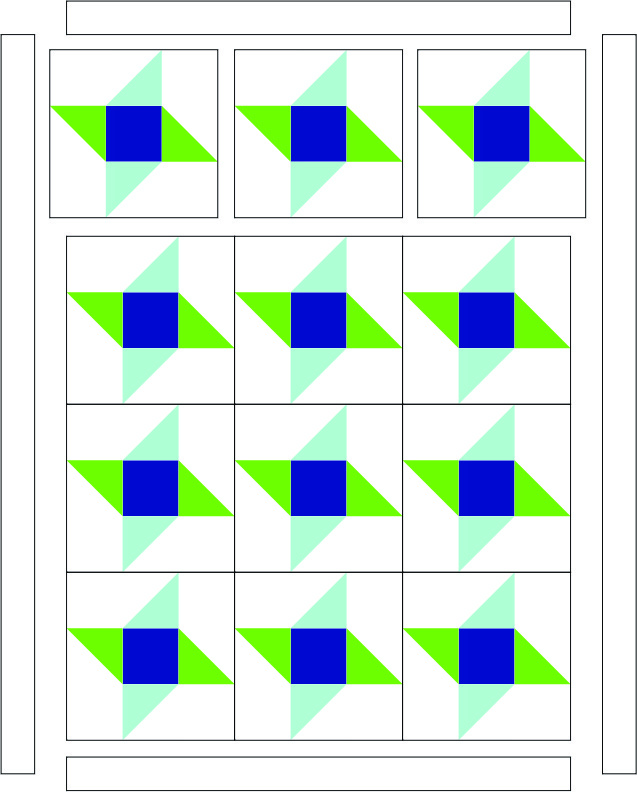 The block assembly portion of the pattern contains the text (and supporting illustrations) to create the block(s) within the quilt top. The first part of the block assembly portion of Ninja Bears is creating the HST. I was able to cut and paste my standard HST instructions (from my instructions pattern piece library in Topic IV) and just change the color in the illustrations and the numbers listed in the instructions. Next, are instructions on how to sew all of the pieces of the block together. 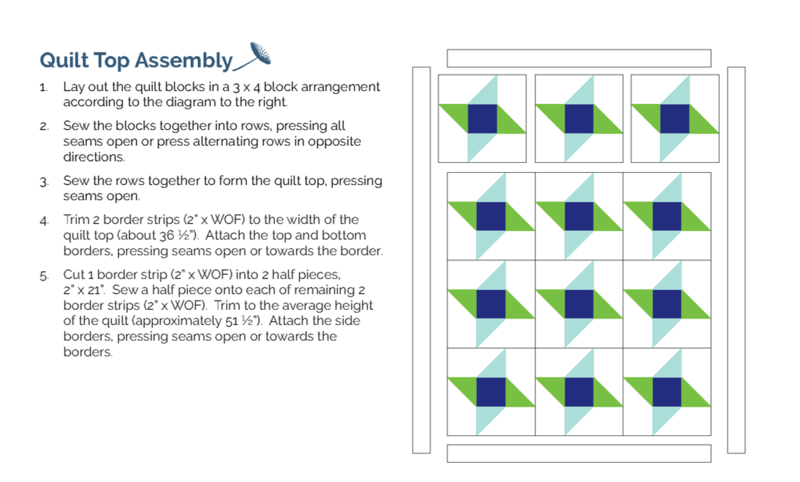 The block piecing instructions for Ninja Bears are short due to it being a relatively simple block. 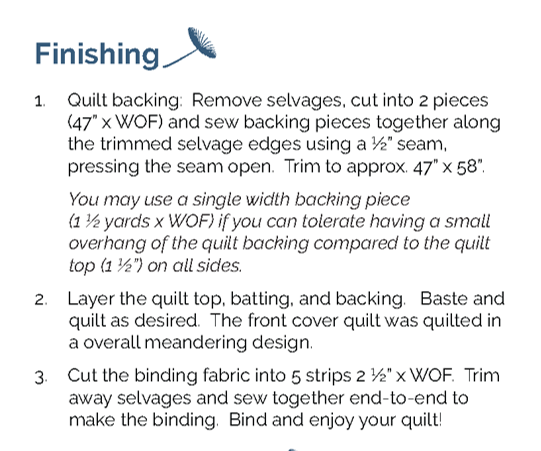 I like to include a list of the different pieces that go into a quilt block; I have received feedback that this is helpful to quilters to organize their fabrics. Make sure to note in the pattern any hints or tips. In Ninja Bears, it is very important to make sure that the HST’s in each star are facing the same direction. Whenever you list a size of a block, make sure you are clear whether it is the unfinished or finished size of the block to avoid any confusion. This is the section of the quilt pattern that explains how to piece the blocks together into the quilt top including whether the blocks need to be rotated relative to adjacent blocks, instructions for any sashing, and instructions for any borders. How much detail to give in this section depends on the assumed knowledge of the quilter using the pattern. You might simply say to add the borders or might go into depth on how to measure the correct length for the borders and go into depth on how to attach them, this is just your personal style. I think that this section of the pattern is one of the most widely varied from pattern writer to pattern writer. Some patterns will go into great detail about how to form the backing, how to quilt the quilt, and/or how to bind the quilt. 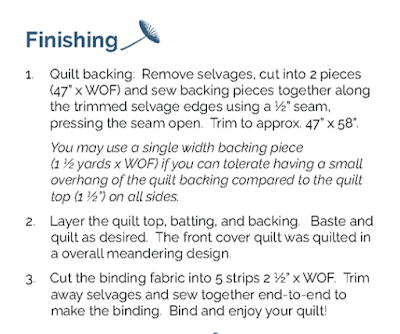 You will find other patterns that simply say to layer the quilt top, batting, backing and quilt as desired and then bind. I think that my patterns fall in the middle of the road, I try to give all of the details related to the specific quilt, like how to form the backing and how to make the binding, but I do not include instructions that would be common for all quilt making like how to baste the quilt and how sew on the binding. Now that we have fully developed Ninja Bears as a pattern, I have uploaded it and made it available as a free downloadable pattern via Craftsy. Hop over to Craftsy right here and download the completed pattern. Thanks for downloading Ninja Bears, if you use it to make a quilt, you can use the hashtag #NinjaBearsQuilt on social media. On Wednesday, the guest designers are going to be answering some questions about writing patterns and on Thursday, Amy from 13 Spools will be posting about writing paper pieced patterns. Next week we will be focusing on pattern testing and will have a super announcement! As part of the Foothills Piecemakers Quilt Guild, we make philanthropy quilts with members making blocks, making quilt tops, and/or quilting the quilts for various charities. I did not make this quilt top but offered to quilt and bind it. The quilt was made by Penny Jones using some fun Cotton & Steel. Charity quilts are wonderful quilts to practice new quilting and binding techniques. It is a win for the quilter to practice a skill and a win for the guild to have some of the quilt tops finished into quilts. For this quilt, I quilted a spiral in the 4-block sections of the quilt and a meander in the long rectangular pieces. It was quick and easy and just a little extra compared to a simple meander. I also sewed the binding on completely by machine, it was great to practice this new-to-me skill. This quilt is now off to a good home through the guild's charity program. Today, we will be visiting Christa from Christa Quilts for a discussion on hiring a graphic designer. Please hop over to her blog for the post and some information and tips. We have now finished up our Topics V and VI on Quilt Math and Computer Programs. 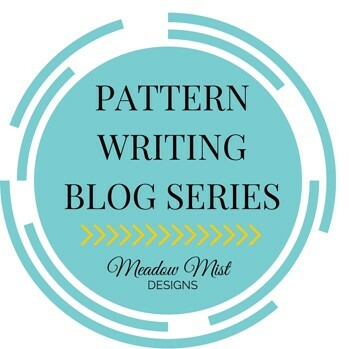 If you have missed any of previous posts in this topic or any of the earlier topics, they are all available in the Pattern Writing Series Tab above. See you next week for Topic VII, Illustrations and Text! On Wednesday, I covered Topic VI which discussed various computer programs available to create your designs, illustrations, text, and pattern layout as well as what I use to create my patterns. In this round table discussion the guest designers are going to share which programs they use in their pattern work. I think that you will be amazed at the variety of programs used by them, it really shows that there is no one "right" program to create your pattern. Tomorrow (Friday, Feb 19th), Christa from Christa Quilts will be posting on experiences in hiring a graphic designer. Which computer program(s) do you use for the illustrations, text, and for laying out the pattern (Word, PowerPoint, Adobe, etc). Did you hire out any of the work out? Christa of Christa Quilts - I use EQ7 to design all of my quilts. When I first began selling quilt patterns, I would import my EQ images into Photoshop for cropping and adjusting. Then I would copy and paste them into a word processing program in between the pattern text. My husband helps me with the photography. I tried to hire that part out to a professional photography studio but found that I could get better detail images of my quilting if I did it myself. I recently hired a graphic designer to make my patterns look more professional. I give her the EQ images along with a “transcript” – a rough draft of the pattern instructions with notes that say “insert illustration 1 here, insert photograph 2 here” etc. She takes the images and imports them into Adobe Illustrator, or redraws them if needed. She then takes the images, words, and photography and lays everything out in Adobe InDesign. Because she’s a quilter, she understands the terminology I am using and knows what I’m trying to convey. If anyone is interested, they can contact her at designbylindsie.com. It’s worth it for me to pay for things I don’t like to do, like graphic design, because she is much faster than I am, and it frees me up to do more of the fun stuff I like to do. Lorna of Sew Fresh Quilts - To write the pattern I use MS Word and, for the illustrations, I use the Paint program on my computer. Soma of Whims and Fancies - I do all of the work myself, using Adobe Illustrator for everything. Yvonne of Quilting Jetgirl - I think it is exciting to see how many different programs there are to accomplish the same goal. I want to encourage everyone to start with something they are comfortable with. My first patterns were drafted using EQ5, and I chose to learn Inkscape as my pattern writing skills improved and I wanted higher quality graphics. You don't have to start out an expert in expert level programs to get started! I currently use Inkscape for illustrations, and I write my patterns in Word. To date, I have not hired out any work. Amy of 13 Spools - Adobe Illustrator for all of the illustrations, and Adobe InDesign for the text and layout - and no! Even for my book, I did all of the illustrations. They listed an illustrator in the front of the book, but I really have no clue what he did…no offense. Seriously, I just don’t know. Anne of Springleaf Studios - I use Adobe Illustrator for all the illustrations and Adobe InDesign for the actual writing and pattern layout. Both my husband and I have degrees in graphic design so the pattern layout process is something we are familiar with. I'm no expert in either program but at least I can manage the basics for what I need. The hardest part of the whole process is getting a really good flat photo for the cover. I have tried indoor photography using lights and outdoor photography with natural lighting. My latest two patterns had a lot of white in the quilt which added to the challenge. I'd love to hear how the other designers handle their photography.